I will be back January 2. Our first real break in the case came as the result of a tip to the Dallas District Attorney's office to the effect that Oswald in applying for a job in New Orleans once gave Jack Ruby as a reference. A Mississippian, Elmore Greaves, had heard this in a casual conversation and passed it on. Someone--I don't know who--told the Dallas DA that Ned Touchstone was studying the assassination and would be a good man to run down the rumor. An assistant district attorney phoned me, and twenty minutes later Courtney Smith (my Watson!) and I were on the way. We learned in New Orleans that federal agents had jealously and zealously erased parts of Oswald's trail. We picked up a potful of fresh leads an an awesome regard for the way key evidence disappears behing the iron curtain of federal bureaucracy. More people were working to cover up the facts than were trying to sincerely unmask the assassination plot. At the state employment service in New Orleans we sought a list of firms at which Oswald had applied for work, and other useful information about his work record. A Mr. Messina showed a handwritten "receipt" dated Nov. 26, 1963, and signed by John B. Lee, a federal who grabbed extensive state records on Oswald. As everyone who saw Oliver Stone's JFK knows, New Orleans District Attorney Jim Garrison, acting on a tip that David Ferrie might have been involved in some way in the assassination of the President on November 22, 1963, had him picked up and held for questioning by the FBI--who promptly let him go. Garrison assumed that they knew what they were doing and and didn't give the matter another thought until he had a conversation with Senator Russell Long, in late 1966, if memory serves. In his book On the Trail of the Assassins, Garrison sums up the interval between these two events in three words: "Nearly three years passed." But is this the whole story? Fall, 1964 Without fanfare, Garrison reopens his investigation into events in New Orleans leading up to the Kennedy assassination. November, 1966 This is the date Garrison uses as the "official" beginning of his investigation. Actually, he has been working on the investigation for almost three years and has questioned many of its important figures. He [Garrison] knew about David Ferries part in the Kennedy killing by early March, 1964--THREE YEARS AGO. His files on March 1, 1964 already contained more volatile information about the killing than the soup-thin oupouring to the public in the Clay Shaw hearing. 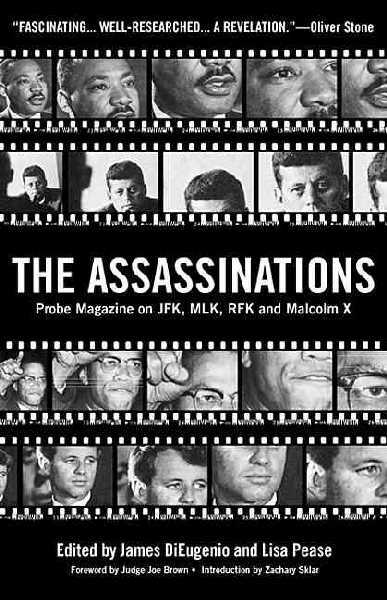 Garrison continued to gather information about the Kennedy assassination--after I learned in 1964 what he had. I kept pace by turning over the same headstones he looked under watching David Ferrie's actions, and using some of the same sources Garrison doubtlessly used. We scheduled a giant rally [Summer of 1965] on the steps of the Louisiana State Capitol in Baton Rouge, only a few feet from where Dr. Carl Weiss assassinated Senator Huey Long almost 30 years earlier. Were were determined that the facts of the JFK murder would not be successfully swept beneath the rug as were the facts of the Huey Long death. Speaking with me that day were General Edwin Walker and Judge John Rarick. (Rarick was later elected to Congress.) Nearly 8,000 people were on hand to hear that talk. Whether any of this had an effect on Jim Garrison is anybody's guess. Jim never indicated one way or another but apparently he had his assistant gathering tidbits of information through most of 1965. 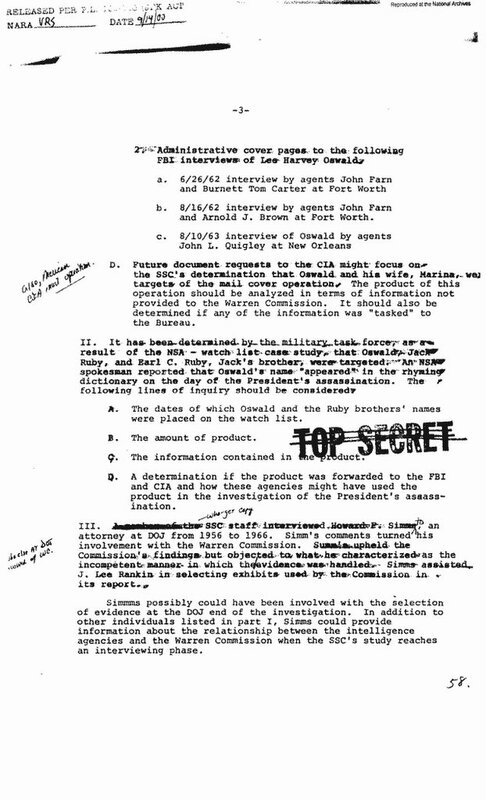 In October of 1966 Garrison's investigation of the Kennedy death was renewed. Tomorrow: Ned Touchstone's investigation of the assassination. Clay Shaw was the only person ever put on trial in the case of the Kennedy assassination. 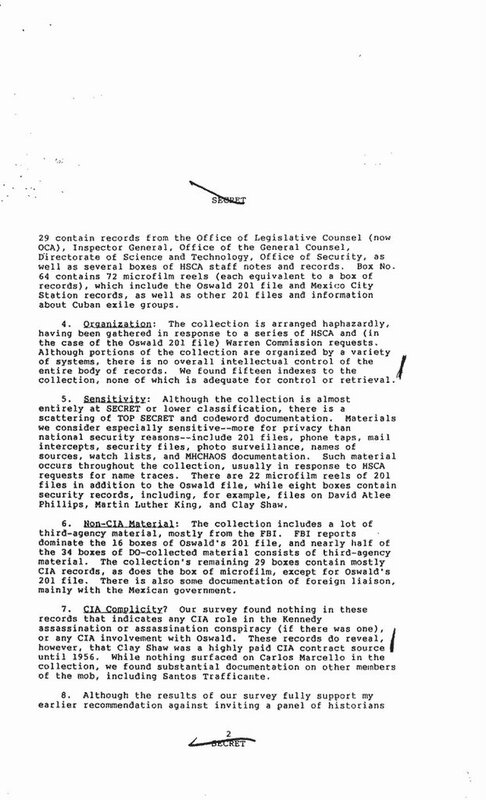 This CIA document reveals that he was a "highly paid CIA contract source." 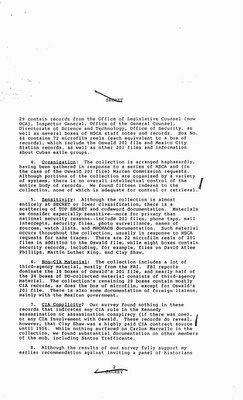 Since the National Security Agency is in the news today I thought I would post some material relating to the NSA and the Kennedy assassination. The NSA is so secret that its very existence was classified for years, and thus NSA is said to stand for No Such Agency. The first reference to the NSA in print, although not by name, may have been by Captain Edward Ruppelt in his book The Report on Unidentified Flying Objects (1956), where Ruppelt refers to the "puzzle palace", later the name of a book by James Bamford on the NSA. 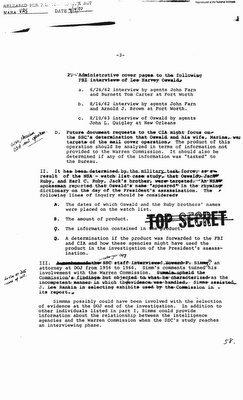 It has been determined by the military task force, as a result of the NSA--watch list case study--that Oswald, Jack Ruby, and Earl C. Ruby, Jack's brother, were targeted. An NSA spokesman reported that Oswald's name "appeared" in the rhyming dictionary on the day of the President's assassination. 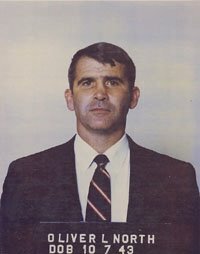 Oliver North is a fixture on Fox News and host of the program War Stories. He has always come across to me as a self-righteous, self-aggrandizing character. To really illustrate what is wrong with the state of our country, one need only note the fact that Gary Webb, a real reporter who documented the Contra/cocaine connection, was professionally ruined, and Oliver North, who was at the center of the whole thing, went on to be a highly-paid "journalist." Americans like Gary Webb are the real patriots. The paste referred to was, of course, cocaine paste. Clarridge was Duane "Dewey" Clarridge, a senior CIA official. I mean, there was a serious international effort to say to Saddam Hussein, you're a threat. And the 9/11 attacks extenuated that threat, as far as I'm concerned. Now "extenuate" means, of course, "to lessen the extent or seriousness of" which is probably not at all what the Moron-in Chief meant. Some newspapers apparently changed the transcript to "accentuated." The reports stop short of saying Iraq is now in a nationwide Sunni vs. Shi’a civil war but one report has concluded that unless the Sunnis can be convinced to come into the political process in the next few months total civil war is likely. The reports also warn that Turkey will not allow an independent Kurdish state inside Iraq on the Turkish border. U.S. officials in Baghdad confirm to TIME that they have stepped up their efforts to negotiate with nationalist insurgents and the Sunnis they represent. "We want to deal with their legitimate concerns," U.S. Ambassador Zalmay Khalilzad." "Insurgency and terror are two different things," says Khalilzad. "This insurgency has got roots, it's got money, and it's got motivation," says a U.S. intelligence official, in an assessment echoed by military officers and insurgent leaders alike. "And the life span of this insurgency could be years." Will we ever see Iraqi security forces capable of crushing this insurgency? Probably not. No," says a high-ranking military-intelligence officer in Iraq. Apparently the people quoted in this article did not get the memo from Donald Rumsfeld. Not only are they "insurgents" rather than "terrorists," they have "legitimate concerns." I would say that negotiating with the insurgents is a good idea. If Iraq continues down the road to becoming an Iranian satellite, however, my concern is that we could eventually end up supporting the insurgents. Stranger things have happened--after all, we armed Saddam Hussein. The National Security News Service has learned from intelligence sources that the United States government is secretly negotiating construction contracts for two permanent bases near the Iranian border and another base on the Syrian border. Regular readers of this blog know that one of my main interests is the Kennedy assassination. We will never know the full story of the Kennedy assassination. People still debate whether it was the Mafia or the CIA. (It was both, in my opinion, but the tail doesn't wag the dog.) A handful of people still maintain that it was Lee Harvey Oswald, acting entirely on his own. The assassination of President John Kennedy is an unsolved homicide but it is more than that. It was a covert operation. 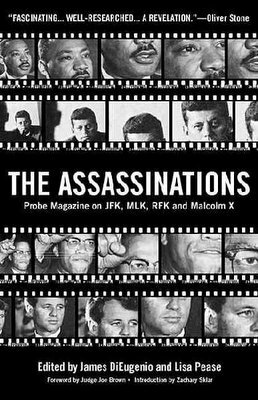 Study of the political assassinations of the sixties sheds a little light on the shadowy nexus between organized crime, the political power structure of this country, and its intelligence apparatus. When people used to join the CIA under James Angleton, he wouldn't let them work in his counterintelligence outfit until they had studied one Soviet deception case, called "The Trust", for two full years. Only then were they fit to study counter-intelligence. Similarly, I wish citizens would study the Kennedy assassination for two years. After that, they would never take any government or media pronouncement on faith alone. They would ask to see the evidence. They would ask better questions, and hold the government and media more accountable to the truth. Israel told the United States it fears the outcome of regime change in Syria. At a strategic-dialogue meeting this week among senior officials, Israel laid out for the United States three scenarios if Bashar Assad is toppled: chaos, an Islamist regime or another strongman from Assad’s minority Alawite sect. Israel fears all those options, saying Assad provides a measure of stability. U.S. officials told their Israeli counterparts that toppling Assad could be “transformative” and dismissed concerns about an Islamist regime taking his place. Israel and the United States favor pressure on Syria to force it to stop hosting Palestinian terrorist groups and supporting Hezbollah, a Lebanese terrorist organization. Perhaps the most security-minded nation in the world, with perhaps the most effective intelligence apparatus in the world, is being lectured by idiot neocon "intellectuals" about what will and won't be "transformative" in their own backyard. For five years, the White House practice has been to call failure by another name: Success. Why did we go down the "suicidal" road of seeking to bring our long term enemies to power as a satellite government of Iran? We are the midwife of a new Shia state. Iran could be months away from a nuclear weapon, warned Mohamed ElBaradei, head of the United Nations International Atomic Energy Agency. ElBaradei told the British newspaper The Independent that Iran's nuclear capabilities depend upon whether it begins enriching uranium. "I know they are trying to acquire the full fuel cycle," he said. "I know that acquiring the full fuel cycle means that a country is months away from nuclear weapons, and that applies to Iran and everybody else." El-Baradei estimated that once Iran's mothballed Natanz underground enrichment plant becomes operational, Iranians could be "a few months" away from a nuclear weapon. International Atomic Energy Agency officials have said that it would take at least two years for the facility to become fully operational. WEYMOUTH: What is the timeline for Iran getting a nuclear weapon? ELBARADEI: It depends on whether they have been doing weaponization. We haven´t seen signs of that. But they have the know-how. If they resume the fuel cycle, they should be able to get the fissile material within a year or two. If they have that, they are a year away from a weapon. It´s a matter of time, because they have the know-how and the industrial infrastructure. In February 2002, after a briefing on the status of the war in Afghanistan, the commanding officer, Gen. Tommy Franks, told me the war was being compromised as specialized personnel and equipment were being shifted from Afghanistan to prepare for the war in Iraq -- a war more than a year away. Even at this early date, the White House was signaling that the threat posed by Saddam Hussein was of such urgency that it had priority over the crushing of al Qaeda. From my advantaged position, I had earlier concluded that a war with Iraq would be a distraction from the successful and expeditious completion of our aims in Afghanistan. 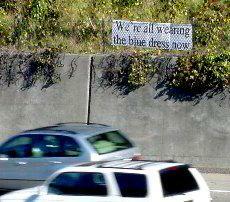 Now I had come to question whether the White House was telling the truth -- or even had an interest in knowing the truth.